Chevrolet’s recently introduced City Express cargo van has begun hitting business fleets, having sold 585 units in January. The smaller van offers fleet customers a more agile and economical vehicle for supporting their various business needs, making it perfect for small operations. Just how many small business customers might the City Express find? Well, According to the University of Michigan Ross School of Business, U.S. small businesses account for 99.7 percent of employer firms. IHS Automotive data also indicates small business registrations have grown each year since 2009 with a 41 from 2009 to 2013. That’s a lot of customers potentially in the market for a small fleet vehicle, according to Peter Adriaens, a professor with U of M’s Ross School of Business. One example of a small business who appreciates the similarly small City Express van is Smokey D’s BBQ in Des Moines, Iowa. The company started in a trailer in a driveway, and has since grown the three locations in the Des Moines area. The company recently took delivery of four City Express vans, saying its small size is what drew them to it. Another small business, Dallas-based Vital Media Security, uses the City Express vans to transport sensitive data to offsite locations. 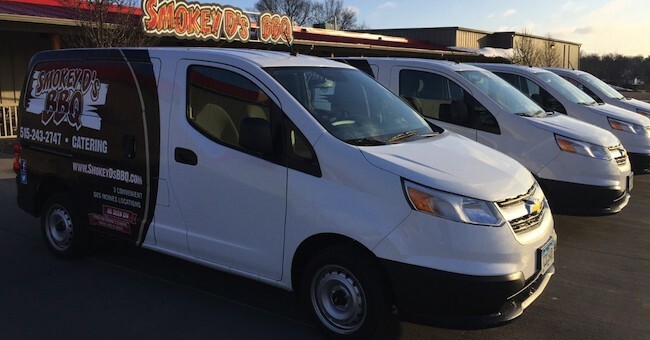 The company recently added two City Express vans to its fleet, and has three more on the way.